Look, how easy it is to make something useful of old junk! 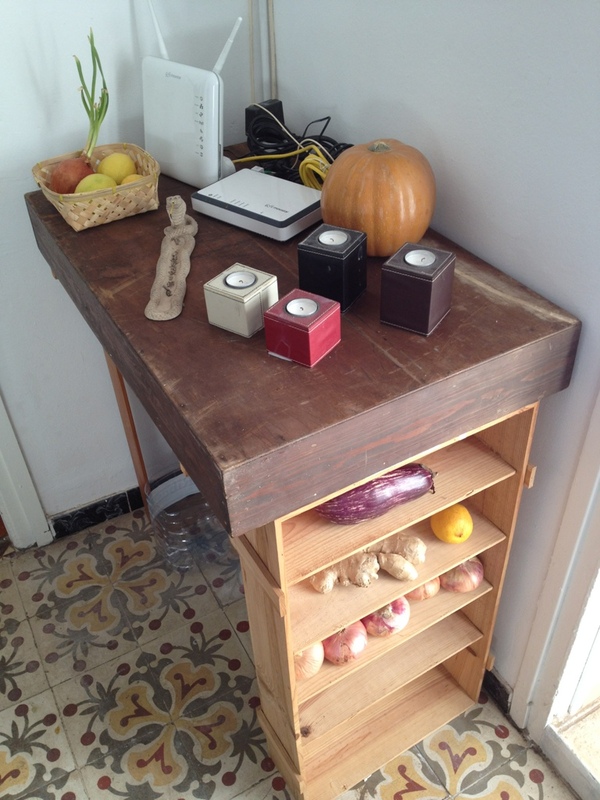 I put an old champagne box, another kind of storage box and a frame together and there it is… A very practical table with small racks on the side for storing fruits and veggies or whatever else we’d like to keep there. I also need to mention how easy it is here in Barcelona, to find old furnitures, decoration and material for reuse or recycling. Every district or suburb here has one specific day a week each, when you can put out whatever things you don’t need anymore, in the street. People hereby get the chance to pick and choose among all things they can find useful. If you find a sofa for example, that you like more than your old one, just change it for that one! This gives the population a possibility to have nice comfortable homes, even if they don’t want to contribute to the stressed consumption society and put further pressure on the planet. If you change some interior every now and then and if you reuse, sometimes remarkably fine arts and furnitures you have hard to understand that someone doesn’t want, then in a few years, you’ll have a wonderful decorated home without spending a fortune on it. This entry was posted in Recycling and tagged Barcelona, Creativity, fruits and veggies, Inspiration, Recycling, Woodworks on May 18, 2013 by sustainaboost.